Here's an big picture view of why we get fat and how high intensity exercise and a ketogenic, low carb diet can help with fat loss. When you eat food and especially carbohydrates, your body uses a hormone called insulin to store the glucose (sugar) that is made from the foods you eat. If you eat lots of carbohydrates, lots of insulin is released to quickly remove the sugar from the bloodstream into your cells where it can be stored. This is a critical function because large amounts of circulating glucose can damage your body via a process called glycosylation. Imagine what maple syrup would do if it was poured on your computer's inner circuits. All the working parts would get super sticky and stop functioning correctly. Insulin's job is to move that sugar out of your bloodstream and into storage as a molecule called glycogen. However, the human capacity to store carbohydrate as glycogen is limited. In a 154 pound man, only about 1800 calories can be stored as glycogen. Some is stored in the liver to be used by the brain, and some is stored in our skeletal muscles as glycogen fuel reserves. The muscle based glycogen is meant to be a sort of "turbo charge" in a "fight or flight" situation, and for any other quick and hard work done by muscle. However, if you don't use this "turbo" fuel by exercising, it stays in the muscles. Once the storage limits are reached in the liver and muscle, your glycogen "tank" is full and no more glycogen can be stored there. When the glycogen tanks are full, the cells of your liver and muscles put up a "stop sign" to insulin. They do this by "downgrading" or desensitizing the insulin receptors on their cellular surface. Since the insulin signal is being ignored, unstored glucose starts to build up in the bloodstream, and more and more insulin must be secreted to move the glucose into the cells. Insulin levels climb very high, and you become insulin resistant. Your liver then sends the excess glucose to your fat cells to be stored as body fat. (The liver can also make the glucose into LDL cholesterol, which is why a high sugar diet is detrimental to heart health). If you continue to eat a high carb diet, glucose and insulin levels increase, and so does fat storage. As insulin levels in the blood remain high, stored fat stays locked in our fat cells. High carb intake = high glucose = high insulin = high body fat. 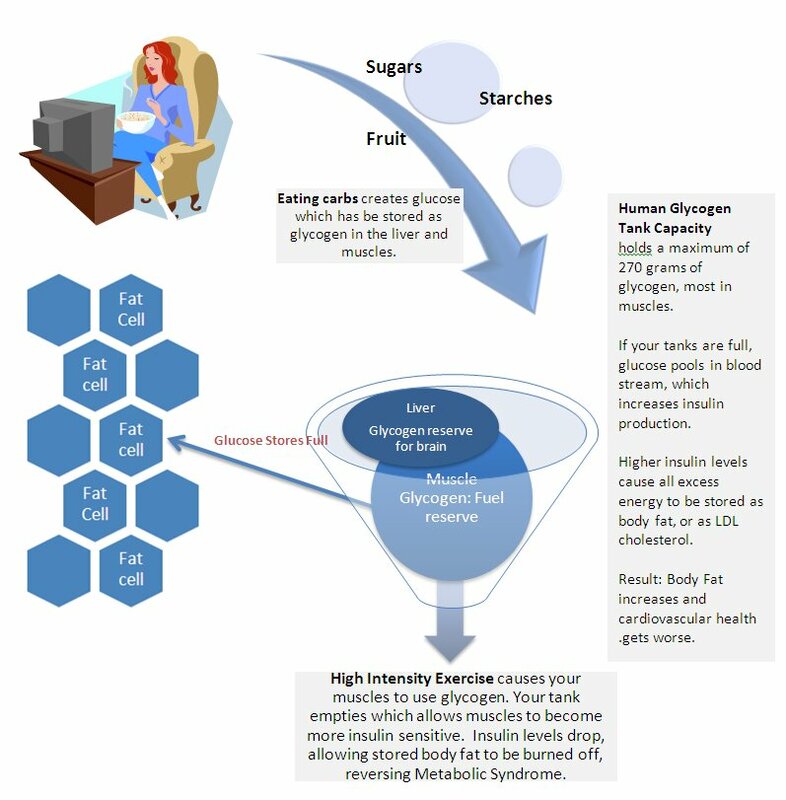 If this condition of having to store excess carbohydrate as fat continues, eventually you develop Metabolic Syndrome, another term for the insulin resistant condition in which high glucose and high insulin lead to obesity, heart disease, fatty liver, and other metabolic issues such as type 2 diabetes. You can now see how reducing your carbohydrate intake reduces the stress of storing excess glucose within your body, and why excess carbohydrate consumption, even from "healthy" complex carbs, contributes to why we get fat. When carbohydrate intake is lowered, lower levels of blood sugar are generated, less glucose needs to be stored, less insulin is secreted, and less fat is created. In addition, another factor that plays into the process of why we get fat is the ability to EMPTY the glycogen tanks in your muscles. Emptying those muscles of glycogen allows the receptors on the muscles cells to once again become sensitive to insulin. As the muscle cells become more sensitive to insulin, and carbohydrate intake is reduced, insulin levels begin to decline. In effect, LESS insulin is needed to store energy. 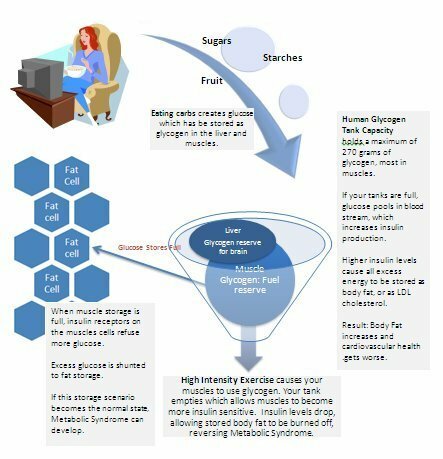 As insulin declines, and less carbs are consumed, your body can then access the fat stored in your fat cells and fat storage is turned into fat usage. Exercise, in general, will utilize some of the stored glycogen in your muscles and provide some help with insulin sensitivity issues. However, high intensity interval training has a stronger effect on insulin sensitivity, because it has the effect of causing your muscles to dump large amounts of glycogen. In addition, if you pair a high intensity exercise program with low carbohydrate intake, more fat will be released for fuel, and insulin levels will drop further. See this study.